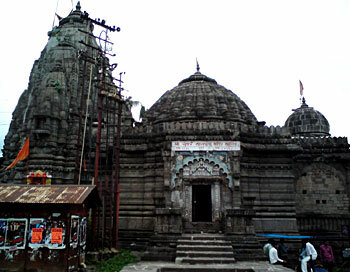 One of the oldest surviving temples of Nasik, two kilometers away from the city. Dedicated to Lord Vishnu known as Sunder Narayan. There is an interesting legend behind the temple. There was a demon called Jalandhar, who got a boon from Lord Shiva which made him immortal. After getting the boon he became rude and challenged even Lord Shiva. He has a devote and chaste wife called Vrinda Devi. The only way to take back the boon from Jalandhar is to challenge his wife�s chastity and kill the demon there after. So, Lord Maha Vishnu duped himself as Jalandhar, started living with Vrinda Devi.Thus, Lord Shiva took back his boon and killed the demon. On knowing this Vrinda Devi cursed Lord Vishnu; his body became bluish thereafter. Later the Lord had a dip on the holy river Godavari ,which passes near to the temple, and regained his colour and beauty (he became Sunder or beautiful again). So the God here came to be known as Sundar Narayan. Unique feature about this temple is that it is built at such an angle that on 21st March, rays of the rising sun first fall exactly upon the idols. The temple is built by Gangadhar Yashwant Chandrachud in 1756.